← top ten ways to encourage someone. see you at bare bones 2011! When I was first told that I’d be leading Bare Bones 2011, I was filled with a sense of excitement but also of uncertainty. I pondered over how I was going take a conference with a well-established five-year history to a new level. I had to take one step back to take two steps forward; I returned to the basics. I wanted the conference’s central focus to be on God and His presence. I wanted to zero-in on the ministry of the Holy Spirit. I know that lasting change truly begins when you give Jesus Christ the Lordship in your life. The Lord brought my attention to Ezekiel 37:4 during the final plenary session at last year’s conference. I read on the next couple of verses and it hit me clearly and surely – to prevent the hype and buzz of typical youth events from taking God’s rightful centre-stage. I believe that Christ doesn’t require fancy lights or impressive performances to move your heart because if Jesus is everything, then Jesus is enough. He alone must be the sole X-factor at this conference. You just need to be still and silent; approach Him just as you are, and not hide behind responsibilities, accolades or experiences. He desires you to engage Him with your core and not your shell; after all, it was King David’s heart for God that caught His attention. You don’t need to impress Him for Him to take notice of you. The adage goes, “The heart of the issue is the issue of the heart”. My sincere question to you: “Would you dare to let God address the issues of your heart?” I believe that unless our heart changes, nothing changes; our behaviour doesn’t change until our values do. Therefore, I want to encourage you to enter this conference with nothing but your “bare bones”. Ask God to breathe life into you as you attend the morning plenaries and evening rallies with an open heart; ask God to put spiritual flesh and muscle back on you as you take part in the knowledge seminars and skills workshops. Let His Word refresh and recharge you as you get renewed in His presence. It is my sincere prayer that in this conference you will find new hope in Him and know Him in a deep and personal way. Come before God without any pretense and let Him touch you in a riveting, life-changing manner. After all, what do you have to lose? 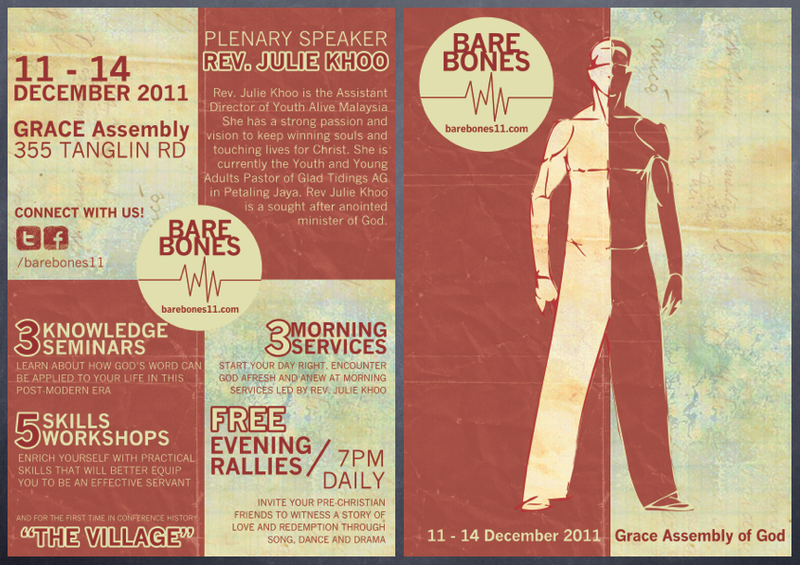 Sign up for Bare Bones 2011 if you haven’t… And if you have, see you there! Posted on December 11, 2011, in Forever Young, Previews & Reviews, Theocentric Orientation and tagged Bare Bones 2011, Rhema Conference. Bookmark the permalink. Leave a comment.